As far as boxers go, Nigel Rubio is fairly new to the sport, but he's not new to competing in the ring. Rubio recently took the next step in his career when he graduated to the ‘open class' of amateur boxing. In the amateur ranks, fighters are matched up with other competitors of fairly equal experience for their first ten fights. That stage of the sport is called the Novice class. After that they enter the Open class and will be in the ring against other boxers who have completed ten matches. A boxer could be up against someone with 11 fights or 40 bouts behind them. His first fight in the Open class took place on March 30, in Toronto. Fighters train for the extra time in the ring, but even training doesn't really come close to actually spending that extra minute in the ring with an opponent. Nigel usually weighs in at the middleweight level, but actually went into the fight as a welterweight after dropping ten pounds due to fighting the flu the week before the bout. At 24, Nigel is a late comer to boxing having started only two years ago, but he has a background in similar sports. “I've done martial arts for a couple of years. I've kind of floated around doing kick boxing and Jiu Jitsu and other martial arts but boxing, I've done for a couple of years,” Nigel said. 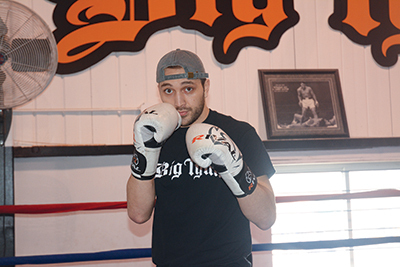 He now works as a coach and trainer at Big Tyme Fitness in Orangeville.